It’s Spring in Beechworth; and although the prospectors, miners and bushrangers have long since gone, along with the gold that attracted them, Beechworth is still an exciting place to be… especially at this time of the year. The pans, picks and pistols have been packed up and replaced with pruning sheers, basket presses and oak barrels. Yes, wine is the new Beechworth gold. And moreishly delicious it is… especially from my favourite vineyard. 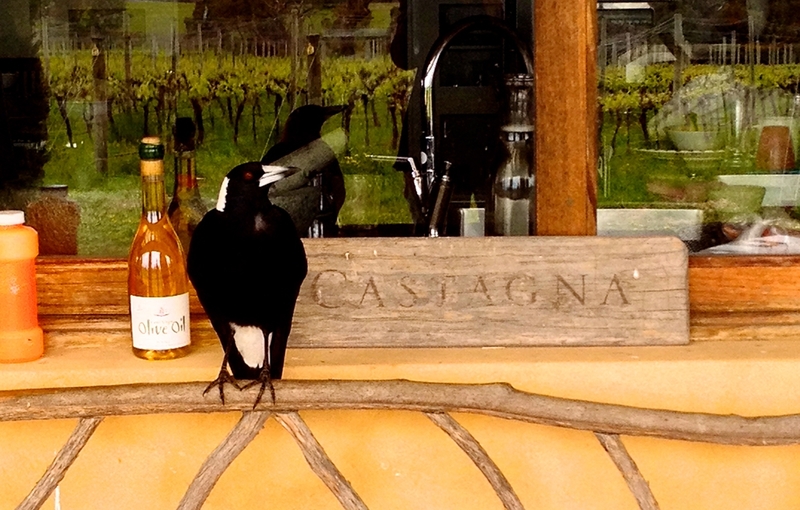 Every year in October, on a seven hectare block of ancient land, not far from the Victorian Alps, one of my very favourite food and wine events takes place: Open Day at Castagna Vineyard. Castagna is a small family owned biodynamic treasure, that once a year opens it’s doors to clients and assorted food and wine geeks. Owner and winemaker Julian Castagna (Italian for chestnut - just another reason to like the guy) is in all likelihood Australia’s foremost authority on biodynamic winemaking. And when you taste his wines you’ll know why. His non-interventionist - let the terroir express itself through the sublime quality of the fruit - winemaking philosophy is more than justified, as you’ll discover, the first time you’re seduced by a mouthful of one of his estate grown wines. Now even though I do this for pleasure, for me the weekend also involves a lot of work. At Julian’s request I organise the menu, and prepare and present the food, with the help of his son Alexis, to compliment his wines. Julian after all is Italian, and as any Italian worth his cannolo knows, wine and food are inseparable. Each year we change the menu, but we always have 3 gorgeous cheeses set up on empty wine barrels to nibble while tasting the wine. Our selection this time was Le Delice de Bourgogne, Colston Bassett Stilton and Hafod clothbound cheddar - all in perfect condition. The sheer number of pizzas made in the woodfired oven, kept Alexis busy… and out of trouble all day. I grilled beautiful spring asparagus on the char-grill and dressed them with the Castagna olive oil and a dusting of Parmigiano Reggiano. Platters of house made salami and little chunks of the superb Parmigiano went round and then the spit-roasted pig was served. We stuffed this guy with fragrant herbs from the garden, including lots of glorious bay leaves - oranges, lemons, fennel and garlic were also included and after several hours of roasting we then pulled it apart and served it with an enormous coleslaw, a carrot and daikon pickle, a garlic mayonnaise, and a spicy black bean sauce. Wow! And if this wasn’t enough, finally, my homemade white chocolate and pistachio biscotti were offered to accompany the ‘Aqua Santa’, a world class, very rare sticky. And a match made in heaven. All Julian’s and his son Adam’s new and current releases were tasted, along with a couple of older vintages for comparison, and every one was an absolute gem; my personal favourites being the Castagna ‘La Chiave’ a seriously sumptuous Sangiovese. And the Adam’s Rib 2009 ‘The White”, a Chardonnay, Viogner and Rousanne blend that took me straight back to the south of France. So from late morning, and on through Saturday afternoon, we were transported to an imaginary villa in northern Italy, where we experienced the delights of Julian’s and Adam’s wines, while savouring some of my lovingly prepared food. Unfortunately, due to very limited production, the Castagna Vineyard open day is an invitation only event for regular customers. So if you’ve never experienced the delights of one of Julian’s, or Adam’s wines, and your local wine merchant doesn’t stock it, just visit www.castagna.com.au and treat yourself to a few bottles - believe me you’ll never look back.